Donations can be made for our Memorial Garden appeal on our Donate or Join page. Please click on the Donate button and this will open up a PayPal window, where you can choose to donate any amount you like and pay by PayPal or by a credit or debit card. Thank You! The Memorial Garden has been designed to reflect the importance of mining to the Gedling area and to those individuals who once worked in the industry. This is even more appropriate since on 7th November 2016 we remembered the pit closure 25 years ago. Raised beds signify the Winding Wheel and the Hornbeam Hedge for the mine shaft that took the miners below ground. The Mine Carts offer a means of reflecting how coal was once transported below ground and reflect on the many pit ponies that once worked and lived constantly below ground. Sticking to the ethos of the site, the planting will be native and the entrances and perimeters offer a means of sympathetically blending the garden into the landscape by incorporating variety of meadow mixes into the scheme. 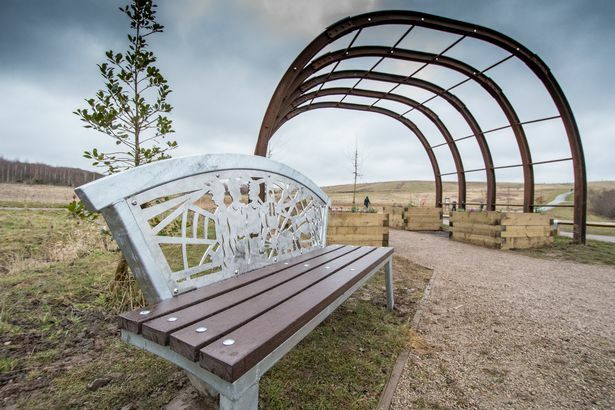 The mix of native trees and a raised octagonal bed, surrounded by benches, provides a place for quiet contemplation of friends and relations who lost their lives at Gedling Colliery. Currently and with the help and support of Gedling Borough Council the Mining Rings are in place, the outline main paths completed and some initial trees planted. However, in order to complete this project we need to raise more funds. We still need mature native trees, benches, Hornbeam hedges and most importantly signage to explain the purpose of the garden and to remember those who gave their lives at the pit. Donations can be made on our Donate or Join page and if you would like to make a donation, please click on the Donate button. This will open up a PayPal window, where you can choose to donate any amount you like and pay by PayPal or by a credit or debit card. A massive THANK YOU to everyone who has supported the Gedling Country Park Miners’ Memorial Garden fund raising campaign in 2015. This includes the volunteers who have been distributing leaflets door-to-door, in shops, local pubs and leisure centres, doctors’ surgeries, face-to-face at the Arnold Carnival and anywhere else we could think of. Thank you also to Gedling Borough Council and the lovely Councillors who have supported us – this support kept us going and it meant more than you realised. Voting has now closed and out of 103 project who went for the £25,000 grants, over 750 people voted for our project, which left us in seventh place as voting closed at midday on Monday 29 June 2015. The funding is allocated to the top four projects and so we weren't successful, but that said, the amount of publicity we have generated for the park is excellent and we hope you will visit it regardless. Whatever happens, this isn’t the end and we are already looking ahead to other funding opportunities for the park development. Watch this space and thank you again to everyone who voted and supported us. BBC East Midlands Today news article broadcast on 18 June 2015 about the campaign to secure funding for a memorial garden in Gedling Country Park. 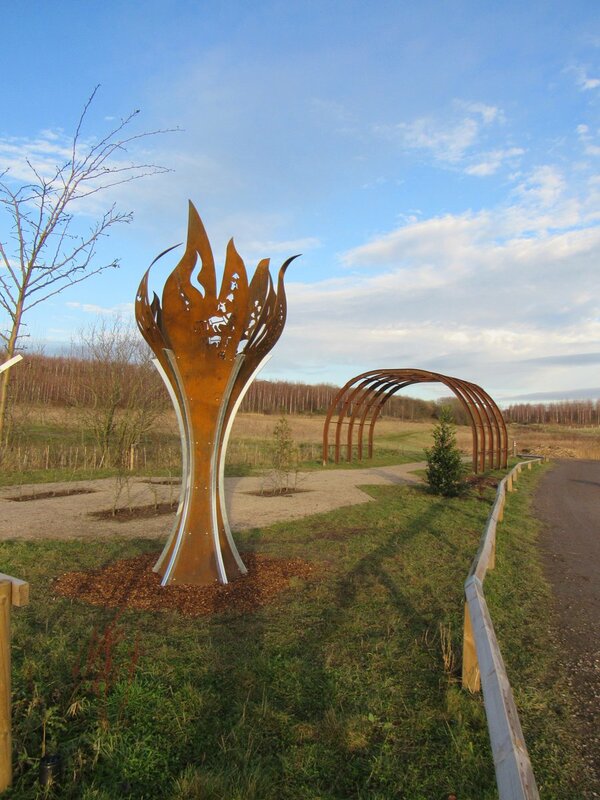 Built on the site of the former colliery, Gedling Country Park officially opened on 28 March 2015. In its infant stage of development, we would like to develop a dedicated area containing a memorial garden – to acknowledge the 128 men who lost their lives in the former Gedling Colliery but also to provide a peaceful place of quiet reflection for all. The proposed garden will occupy a unique location in the new Gedling Country Park where cycling and walking routes meet, providing outstanding views. The park’s new footpaths are named after the old worked underground tunnels, which are now filled in. The rings that supported the original mining tunnels are the proposed pergola rings for the memorial gardens. Utilising reclaimed mining artefacts, we would like to create a lasting memorial to our heritage. 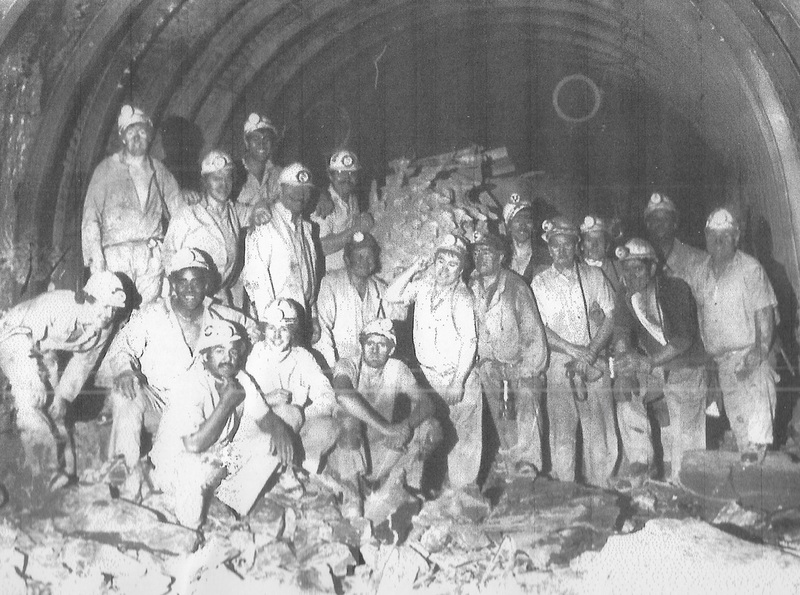 The coal mines were the backbone of our county for many years. As the last mine closes in Thoresby, Nottinghamshire, this memorial garden will remind us of our history. Our aim is to create a symbolic structure and beautiful place of quiet reflection to acknowledge the contributions and loss of life made by the local community. The park is managed by a charity called the ‘Friends of Gedling Country Park’, a group of volunteers whose main aim is to make the park a place that is accessible by all and for the benefit of the wider community.